A Cobnut is a type of hazelnut traditionally grown in Kent. They are harvested in their green state form mid August and with brown shells and husks by mid October. All the Cobnuts are sold dehusked from November onward. 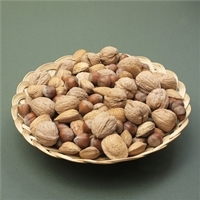 A Walnut is an edible nut often encased in a smooth green husk and mainly grown in California, France and Italy. These Walnuts have been specially selected by Potash Farm for quality, size, ease of cracking, and good flavour. 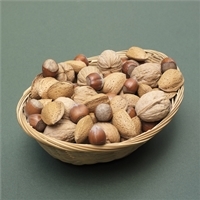 An Almond is an edible nut encased in shell with a downy outer grey / green coat. They are mainly grown in California, Spain, Italy, Australia and Turkey. These Almonds have been specially selected by Potash Farm for quality size and good flavour. Promotional offer of 1kg each of our popular Dehusked Kentish Cobnuts, Chestnuts, and Wet Walnuts. The Naturally Grown Green / Golden Cobnuts are available now, and I advise all my potential customers to place early orders to avoid disappointment. The Green / Golden Cobnuts are available now, and I advise all my potential customers to place early orders to avoid disappointment. These are another speciality of the Potash Farm range of gifts. Attractively presented within the bag are dehusked nuts. These make an excellent Christmas, Easter, or one-off gift and are available in two sizes. This exclusive Kentish Cobnut Oil is grown, pressed and packaged by one of Potash Farm’s neighbours. It is ideal for drizzling over salads, grilling fish or meat and suitable for flash-frying or woking. Featured on ITV Ade In Britain, BBC The Hairy Bikers, and ITV The Hungry Sailors.